Does looking at a honeycomb, aerated chocolate or any other cluster of holes trigger an emotional reaction? You may have trypophobia, more commonly known as a fear of holes. But when the respected journal Psychological Science wrote about the condition in 2013, Emory senior Meghan Hickey was suspicious. A fear would stem from the sympathetic nervous system, which directs the commonly known fight-or-flight response. Phobias are thought to have evolved from perceived and real threats, such as that of potentially venomous snakes. But people who claimed to have the disorder didn’t describe that sort of reaction. They used words like “repulsive” for the images and claimed to feel nauseated by them. Hickey, one of 14 grantees in the Scholarly Inquiry and Research at Emory (SIRE) program this spring, wanted to nail down just what was going on. A psychology major who grew up near Boston, she saw the research as a way to find the right care for those who suffer from the condition. Hickey’s research used eye-tracking equipment in the Emory Spatial Cognition Laboratory to measure pupil responses from volunteers who were shown a series of images similar to those in the research reported in the peer-reviewed journal. When the images were true threats such as spiders and snakes, the volunteers’ pupils dilated. That uncontrolled response indicated that they were preparing for the intense physical activity associated with a fear reaction. Neutral images, such as that of shoes, drew no significant response. But when shown the images of holes — like those of the animals, gray-scaled to calibrate the response — the volunteers’ eyes constricted. Stella Lourenco, the psychology professor who served as Hickeys’ mentor, said despite the finding, Hickey’s work was far from over. There is significant debate in psychological literature about differentiating between fear and disgust. Hickey conducted her research a second time, this time showing volunteers the same images as before and adding a new series: similar symmetrical images such as boxes and lines. Had volunteers’ eyes constricted similarly on the other symmetrical images, Hickey’s earlier study could have been discounted because the reaction could be explained on the eyes focusing. But that didn’t happen. The results were very clear cut: The reaction in trypophobia is actually one of disgust. Hickey’s findings are expected to be submitted to journals, Lourenco says, because they highlight the growing overlap between psychology and neuroscience. 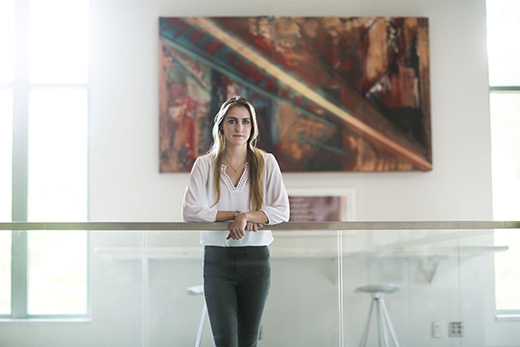 Hickey, who worked with psychology graduate student Vladislav Ayzenberg on this study, says the research emphasized her interest in the biological underpinnings of psychology and led her to an unexpected career path. She began taking a full slate of pre-med courses last year and also started volunteering at the Grady Memorial Hospital emergency room. Although she didn’t start college intending to be a doctor, she now plans to attend medical school after a gap year traveling.